A backsight with at least one clear horizon and an indicated direction but no plausible explanation. (E.g. 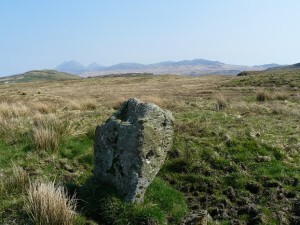 remains of a stone circle.) 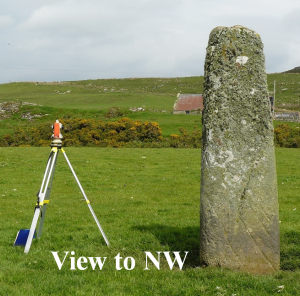 For these stones the indicated directions appear to be random and in no case is there a usable foresight feature with a key lunar or calendrical declination. Directions ± 10⁰ of the indicated direction were checked with null result. There is no certainty that they are (or were) waymarkers, but whatever their purpose they are not backsights for alignments. A somewhat irregular stone block about 1.2m x 0.8 x 0.5m. It is situated on a slight rise about 1 km. 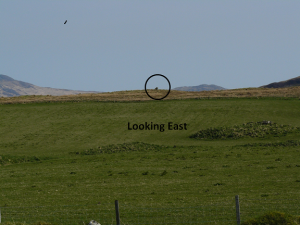 south of Knockleary (IS11) and can be easily seen from many directions. There is no indicated direction and no alignment was found. 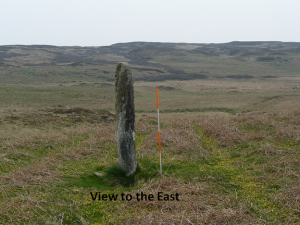 A large somewhat irregular slab 2.5 x 1.4 x 0.5 m. It is aligned close to North/ South. There can be be alignment in either direction. In the south the distant skyline is too low - the moon in that direction would be about 4° above the horizon. The moon (or sun) could never be in the region indicated to the north. 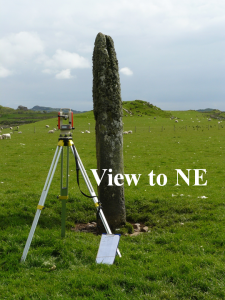 A fairly regular slab 2.7 x 0.8 x 0.4 m. aligned close to East/ West and leaning at about 20° to the south. 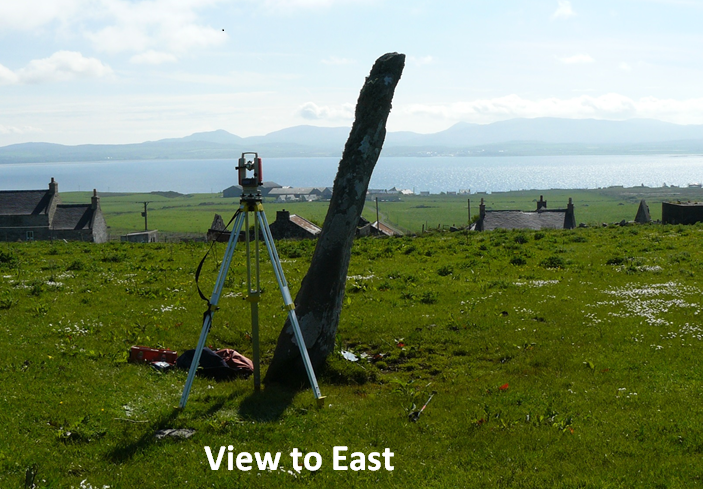 The can be no alignment to the west where the featureless ground rises to the nearby horizon. The view to the east is as shown. No alignment was found. 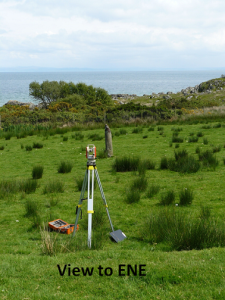 A slab 3.0 x 0.7 x 0.3 m. orientated approximately East/ West in a shallow basin with some features to the east. 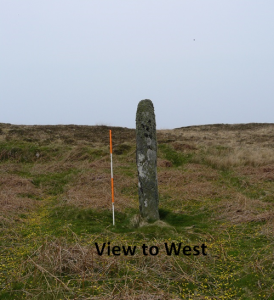 It gives no alignment and so given as a 'waymarker' despite the fact that a typical waymarker is usually more prominently situated. 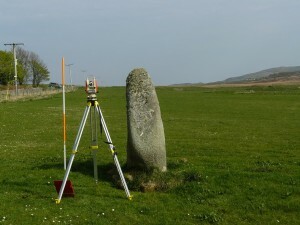 A regular, possibly shaped, stone 2.5 x 0.9 x 0.4 m. No alignment was found. 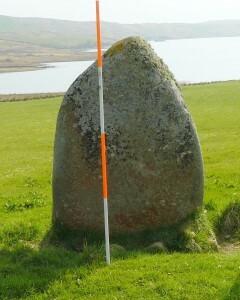 A stone 1.8 x 0.6 x 0.35 m. Situated new the shore with a view (ENE) to distant (30 km.) hills on the mainland. No alignment was found. 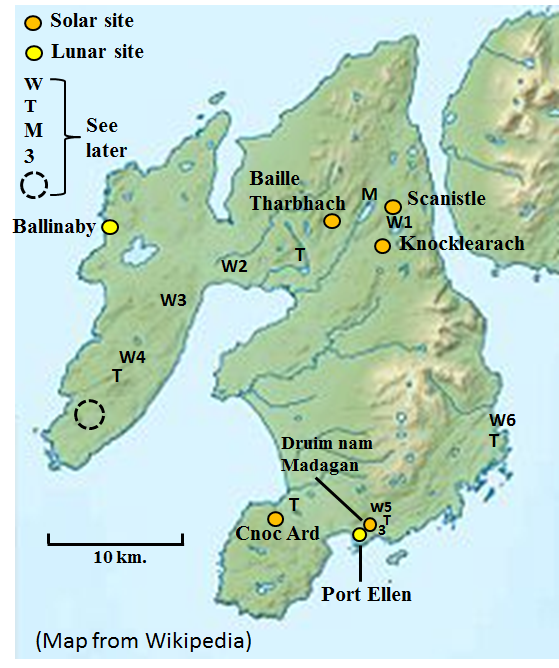 IS4 Finlaggan (Map ref. 3927 6856). This stone (2.0 x 1.3 x 0.6 m.) is very regular and probably shaped. 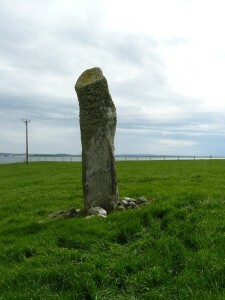 It gives no alignment and is probably associated with the nearby ruins which were the headquarters of the 'Lords of the Isles' dating from about 1300 AD. IS41 Laphroig (Map ref. 3895 4607). A fine 3 stone row, 6 m. long and orientated close to North/ South. 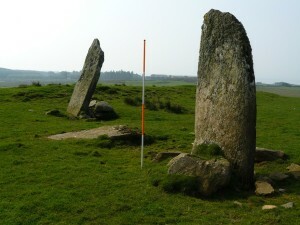 The end stones are both about 2.5 - 3 m. tall. The central one (fallen) is of similar size. The horizon to the south is low and the southern major standstill moon would have been some 4° above it. The moon could never have been as far north as the opposite direction, and in any case there is a nearby large rock outcrop in that direction. Such North/ South orientations without alignments are not uncommon but must have served a purpose. 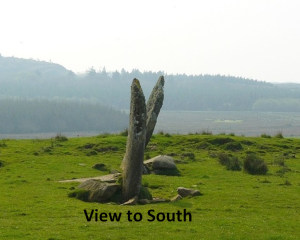 Although stone circles are not generally considered in this blog, Cultoon is relvant as there is a possibility of an alignment. 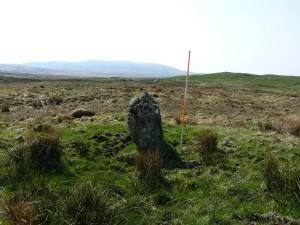 Namely the long axis of the elliptical circle indicating a hill in the SW on Northern Ireland some 40 km. distant for the winter solstice setting sun. This entry will be continued when a suitable photograph of the relevant feature(s) is obtained.